Two philosophers with relatively popular Twitter accounts have quit using the social media service in recent days, both citing the mental tolls their engagement with other Twitter users has taken. Manne was the fifth most popular philosopher on Kelly Truelove’s “Philosophers’ Favorite Twitter Feeds” list. Earp was 35th on the “Philosophers’ Favorite Twitter Feeds” list. Two departures is not sufficient for a trend of any sort (if you know of similar exits, let me know), but they are a reminder of the challenges of online engagement, both with the public and within philosophy. 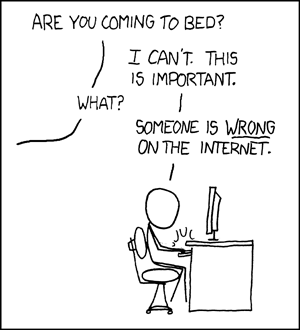 Modeling exemplary discourse online can be exhausting and dispiriting. The sheer volume of nonstop communication Twitter facilitates can be overwhelming. It is not always easy to resist provocation from trolls-at-large and members of the profession who seem to enjoy being jerks. Plus, the public is so large, and individual conversations so small, that after a while it is only natural to wonder whether one’s efforts are making any difference at all. As for what to do about the “meanspiritedness, mockery, point scoring, snideness” and the like that Earp sees academics accepting, I have no solution. However, it might be useful to keep a couple of things in mind as you engage online on Twitter, Facebook, blogs, etc.